The aim of the project: under the supervision of experts from Maastrciht University train and certify the faculty members of TSU in Problem-based Learning teaching and learning methodology. – creating conditions for the PBL introduction and development at TSU. The project “The Creation of Regional Center of Competence in the Field of Online Learning” is aimed at implementing the objectives set by the federal priority project “Modern Digital Educational Environment in the Russian Federation”, namely “Creating a system of advanced training for teachers and specialists in the field of online learning”. Having in mind the development of the digital economy in the Russian Federation, a serious improvement of the entire education system has to be made, including the provision of universal digital literacy. Online learning is becoming the basis for changing the global educational architecture based on a new educational technology platform, digital pedagogy, virtualization of educational activities, globalization of education. In this regard, the creation of centers that will enable teachers of all levels of education to acquire relevant competencies, propose new standards and regulations and overcome the academic community’s distrust of online learning is extremely relevant. The establishment of the Tomsk Regional Center of Competences in the Field of Online Education (TRCCOE) with a reference site at the National Research Tomsk State University (TSU). The center should carry out integrating and coordinating functions, optimally combining the interests of educational organizations in the region within the framework of a unified state policy in the field of education. To ensure the creation of OC with the participation of employees who have been trained in advanced training programs. Galina V. Mozhaeva- candidate of History, Associate Professor, Head of the Laboratory for Research in Humanitarian Problems in Computer Science, Directore of the Institute of Distance Education, TSU. TRCCOE should become a catalyst of a radical transformations and innovations in the educational system of the Tomsk Region, Siberian Region overall; and have a positive effect on the social and economic development of the Region. TRCCOE has a great potential because of the unique location, support of all universities in Tomsk Region, especially the working platform at Tomsk State University. The results of the Center will help developing the online learning industry in the Tomsk Region and other regions of the Russian Federation involved in the work of the Tomsk Center. Target group: students and staff of educational institutions of HE and vocational education, schoolchildren, developers and users of online courses. Project Website “Modern Digital Education Environment”. TSU page on the portal National Open Education Platform (OpenEdu). Online educational projects are projects oriented to e-learning development, implemented by using online technologies. Online-course is a training course with massive interactive participation using e-learning technologies and open access via the Internet. It is one of the forms of distance education. As a supplement to traditional materials in educational course such as videos, reading and homework, open online courses provide an opportunity to use interactive user forums that help to create and support a community of students, teachers and assistants. Improvement of the education quality by virtue of integration of classical forms of education with e-learning technologies. To organization training and participation of TSU teachers in designing online courses for Russian and international platforms, including in English. To develop methods for evaluating the effectiveness of e-learning. To monitor and conduct expert review of online courses and e-learning courses in general educational and additional programs. To improve methods and design techniques for digital educational content and providing e-learning. TSU MOOC students, full-time TSU students and students from other Russian and international universities, and also audience of supplementary vocational education programs, developed based on MOOC. The aim of the project is to create in TSU a replicable model for organization of students’ project activities by the implementation of interdisciplinary educational programs in cooperation with corporate representatives in the field of digital technologies and to test and endorse the acceleration model on StrAU “Institute of Human of the Digital Era” master programs. 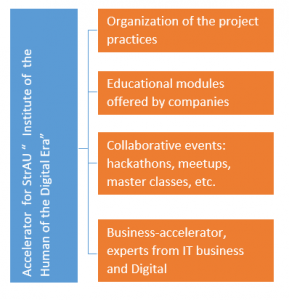 StrAU “Institute of the Human of the Digital Era” arranges work of a cluster of companies in the field of digital technologies in Russia and the world (The StrAU business experts club). This cluster is supposed to perform project support for undergraduates in research practicals and job training; also, provide support for general StrAU events (enrollment campaign, supplementary education, event activity: hackathons, supplementary education, master-classes, etc.) on a long-term basis.